Powers/Abilities: Although he may have had other supernatural powers, the Man from the 5th Dimension only displayed the ability to transform himself into a ball of light to travel back to his home dimension...or perhaps the ball of light was his "true" form. History: (Amazing Adult Fantasy#12/3 (fb) -BTS) - A bespectacled little man from the 5th Dimension left his home to visit the dimension of Earth. 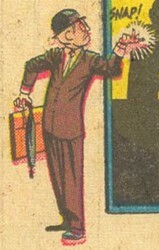 (Amazing Adult Fantasy#12/3) - The little man went to the offices of Marvel Comics and stood outside the editorial office, where he overheard writer Stan Lee and artist Steve Ditko feverishly working to meet their deadline to complete the latest issue of Amazing Adult Fantasy, but neither of them could come up with any new ideas for a story ("Well, how about a flying saucer story?" -- "You kiddin'? We've done a million of 'em!"). The little man walked into the office and offered to help the creative duo, claiming he had some of the most fantastic story ideas that they'd ever seen! Stan appreciated the offer, but asked the man to leave because they were really busy. But when the man refused to leave until the two saw some of his story ideas, he was (literally) kicked out of their office. Taking the hint that he wasn't wanted, the little man picked himself up, dusted himself off, snapped his fingers, and transformed into a ball of light, then travelled back to his home dimension to see how the battle between the Kreeks and the Zooboos was going along. This story kind of reminds me of Fantastic Four I#176, wherein the Impossible Man ran amok at the Marvel offices, trying to convince them to do a comic book about him. 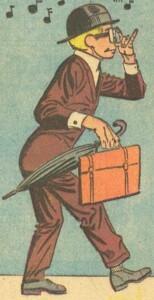 Hmm...over in the DC Comics Universe, Superman's old foe Mr. Mxyzptlk (who also wore a silly little derby hat) comes from the 5th Dimension, too...you don't suppose...Nah, who'd ever believe something like that! ...and fear not, Stan and Steve weren't fired for not making their deadline; in fact, a few months after this story ("Something Fantastic?") was published, they created "something amazing" -- a story about this kid who gets bitten by a radioactive spider...anyone ever hear about it?